Anna earned a Bachelor's Degree in Psychology, a Psychological Science Certificate, and a minor degree in Spanish from undergraduate education at Indiana University. She is now studying for a Master's Degree in Social Work at Indiana University in hopes of obtaining professional licensure. 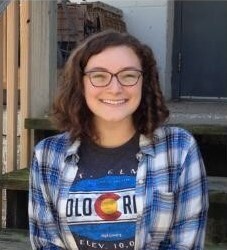 Anna is interested in social work with specific focuses in mental health, criminal justice, addiction, and environmental justice. She enjoys learning about the justice system in both academic and professional settings, which lead her to provide social work resources for the patrons of Justice Unlocked. Anna works as the Social Work Resource Provider on staff by connecting clients to agencies in their communities that may help with additional services not specifically provided by Justice Unlocked. Please let us know if you would be interested in receiving these services!